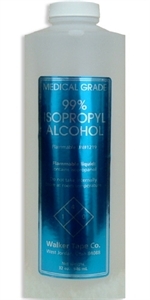 Medical Grade 99% Isopropanol Alcohol. Medical Grade 99% Isopropanol Alcohol. This product insures that the surfaces of the skin and the base of the hair system are both 'Oil Free' which increases hair system adhesion times. Note: This item can only be shipped using ground shipping (no air or overnight) and can only be shipped within the Continental US.